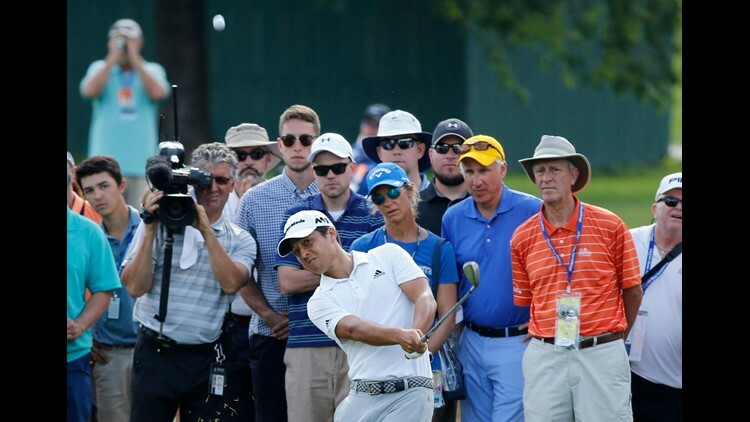 SAN DIEGO (CNS) - Former Scripps Ranch High and San Diego State University golfer Xander Schauffele shot 14-under par over four rounds to win his first PGA Tour event Sunday, making a birdie put on the 18th hole of his final round to win the Greenbrier Classic by one stroke. The 23-year-old former Aztec shot three-under par in the final round to edge out Robert Streb at the Old White TPC course in White Sulphur Springs, West Virginia. "Very nervous, just at a loss for words," Schauffele told PGA.com of how he felt just before sinking his winning birdie putt. Joining Schauffele near the top of the leader board was Jamie Lovemark, 29, who graduated from Torrey Pines High. Lovemark finished in a two-way tie for third by shooting 12-under, just two strokes off Schauffele's winning scorecard. San Diego native Phil Mickelson, a five-time major championship winner, finished tied for 20th at six-under par. Mickelson entered the final day of the Greenbrier Classic at even par after an up-and-down first three days, but he shot a six-under 64 today, his best round of the week on the par-70 course. Schauffele rode a steadier path to his first PGA Tour win, shooting a six-under 64 on Thursday, a one-under 69 on Friday and a four-under 66 on Saturday before closing strong with birdies at 16 and 18 to shoot a three-under 67 today.